We have done some changes here at home. I have almost finnished my studies to become an Interior Designer, so what would be a better place to practise than our own home. Here is one of the changes that we did, kidsroom. 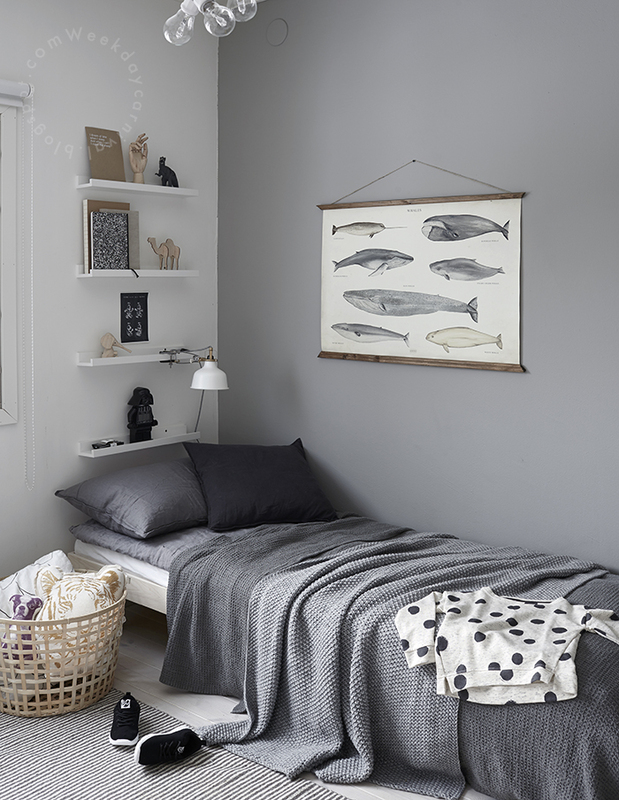 We painted one wall with this lovely grey colour that we found from Tikkurila´s new Pro Grey colour map. 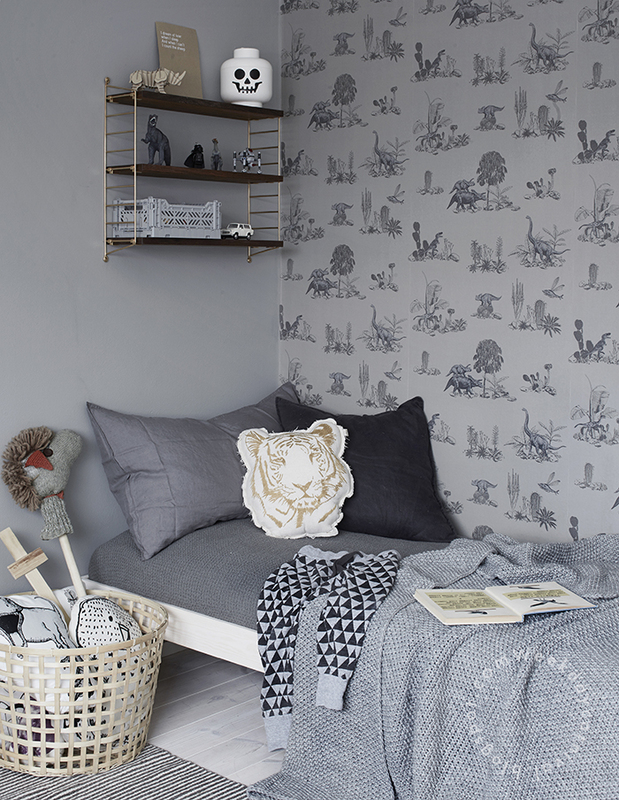 My kids love dinosaur´s, so we orderd this dino wallpaper, that has this lovely vintage look in it. Wallpaper is from Siang Zeng. I think it is just perfect! Wooden basket, wall light and white shelfs we got from IKEA. 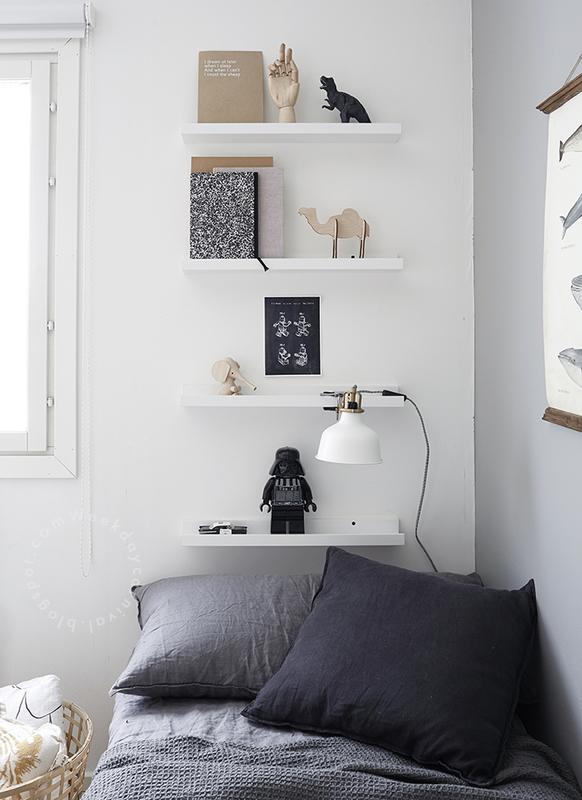 That basket is perfect to storage place for all extra pillows and soft toys. I can honestly say, that our kids love their room now even more. This room has become more restful now after this little change. You can look from here, how our kids room looked before. Well done Riikka I love it! Really beautiful and calm result! Love the playful details as well. Thank you! Dinos and legos still rocks! Just one word: perfect!! Love it! They are 7 and 5, but people are uniqe and some like colours more than others. I think that specially my older son would feel restless in space full of colours so it is a good place for him to calm down and sleep well. Wonderful! Where did you get the other shelf? I love it! That is string system. It is a special edition from their aniversary collection. Love both rooms, great job! Hi and thank you! We made the beds by ourself. I wanted something really simple and timeless so this is what we came up to! oh would be great to get some instructions. Would love to make a own bed too. So a beatibul room! I love the grey blankets!! Yes those are nice and cosy! ohh wonderful ideas, thanks! i have a grey's room too and i love it! Hei vinkkaaappa että mitkä sängyt kuvissa on? Ihan mieletön! <3 Olet lahjakas! I love love it § Where does come from the blanket ?? Love the rooms very much !! Where did you find the blankets ? love your room so much !! inspiring me for my boy ! Love it! Where did you get the whale poster? Lovely, I'm also wondering where you found the whale poster? wonderful! I love the picture "frame" and the whale poster. Where did you buy them?